Since 2009, Goodwill of the Southern Alleghenies has aimed to create change in the community one young person at a time through its GoodGuides Youth Mentoring Program. Because January is National Mentoring Month, several of these adult volunteers were recognized on Saturday for hours of mentoring over the past year during an awards ceremony at First Presbyterian Church in downtown Johnstown. Sandra Cashaw was one of 22 mentors honored with the Presidential Volunteer Service Award, given to volunteers who invested at least 25 hours in 2015. Cashaw contributed 48 hours during the past year, but has been mentoring youth with the program since its inception. “I just love young people,” she said. For several years, Cashaw said she would volunteer up to 40 hours a week when she mentored a young girl before she aged out of the program. “I mentored her like she was one of my family,” Cashaw said, adding that now her own grandchildren are involved with the program and participate in group mentoring activities. Photo by Thomas Slusser/Tribune-Democrat: Among the 22 GoodGuides volunteer mentors honored Saturday, Jan. 16, 2016, during a ceremony at First Presbyterian Church in Johnstown were (from left, front row) Sandra Cashaw, Verna Carter, Saria Haselrig and Jill Marsh; (middle row) Jim Richey, Tony Penna Sr. Jodi Huston and Wendy Rex; (back row) Matthew Bost, Gary Bochniarz, James Lewis, Jackie Allison and Paul Nikonow. The GoodGuides Youth Mentoring Program is a national initiative operated locally by Goodwill of the Southern Alleghenies through grants from the U.S. Department of Justice, Office of Juvenile Justice and Delinquency Prevention. The program is designed to help those ages 12 to 17 in Somerset and Cambria counties who may have barriers to success by focusing on building career plans, postsecondary training and providing structured and supportive relationships with adult mentors. Mentors are asked to volunteer four hours per month or one hour per week for at least a year. Community members and businesses are sought out to organize career talks, workshops, company tours and educational guidance. 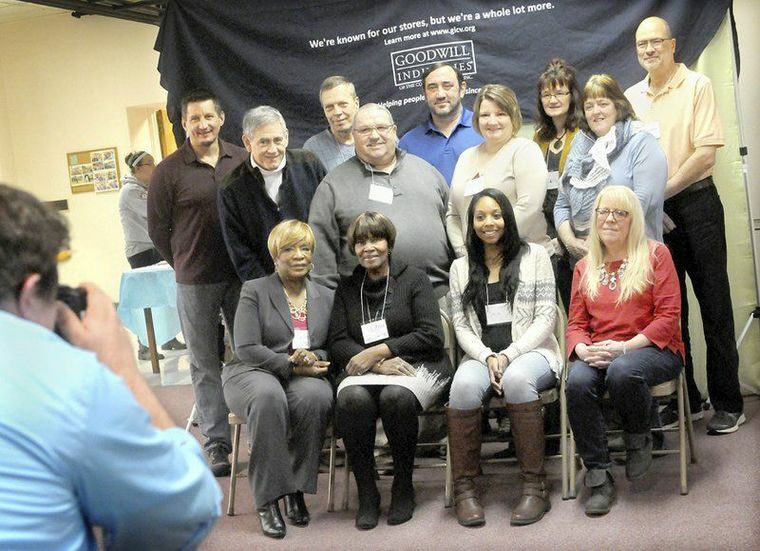 Ann Torledsky, vice president of workforce development for Goodwill Industries, said young people are referred from schools and churches, while volunteers are recruited from local businesses. As more youths have come into the program, organizers have had to put together more group activities because there aren’t enough volunteers for one-on-one matches. Twenty mentors were recognized Saturday for a combined total of 1,077 volunteer hours. Two of the volunteer mentors, Jill Marsh and Greg Karcher, were honored for 100 or more hours during 2015. Marsh contributed more than 372 hours, while Karcher volunteered for more than 106. DelaMeesia Sutter,14, of Johnstown, has had a mentor for two years and considers her a friend. She said the program has allowed her to meet friends from her school and other local schools, and when she’s older, she’d like to become a mentor. Cashaw encouraged more adults to get involved. “It takes a lot of people, it takes a lot of work, it takes a lot of love,” she said. For more information about GoodGuides, contact Cindy O’Connor, GoodGuides program manager, at 536-3536, ext. 304, or email goodguides@goodwilljohnstown.org.